In a concert staging that can only be described as all class, musical wunderkind Matthew Robinson gathered a dozen of his oh-so-talented friends to knock the socks off members of the Melbourne music theatre cognoscenti who were lucky enough to have secured a ticket. Robinson’s mighty score held the audience spellbound, as the enthralling tale of Atlantis unfolded through majestic music and supremely intelligent lyrics. Somehow, Robinson has the composure, as musical director, to sit in the middle of the action and accompany the performance on grand piano. In bringing the fabled island to life, Robinson has created an involving set of characters who live, love and strive in the peaceful, insular, heterogeneous land of Atlantis. A new arrival sparks a divisive debate, part political/part religious, and the allegory of a people unable to listen to what the land is telling them plays out to its dramatic conclusion. Director Chris Parker supported the clear storytelling by supporting the cast’s development of the interesting facets and flaws of the lead characters. Vocal and facial expression were key, as dramatic movement was practically nonexistent, save for a couple of crucial moments. Unexpectedly detailed, given the briefest of rehearsal times, Tom Willis’ lighting design greatly aided audience focus. 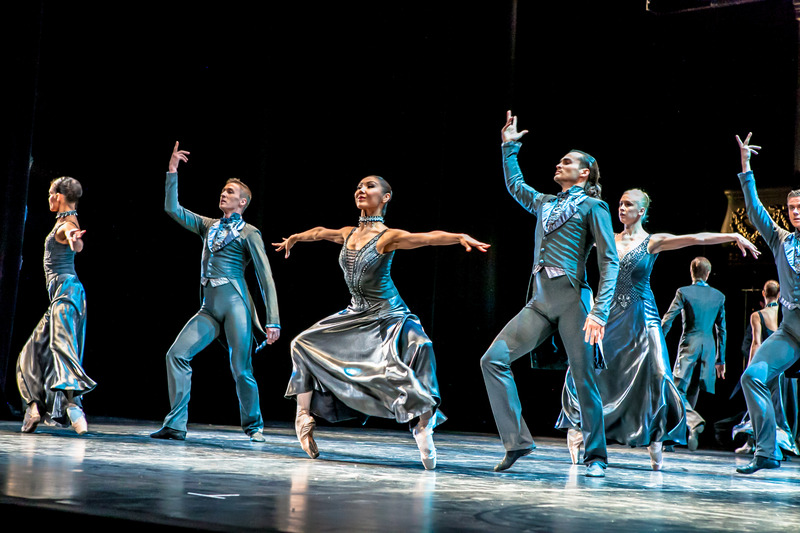 Sound design, by Marcello Lo Ricco, was reliably pristine, and, again given the short preparation time, achieved an astonishing balance in vocal harmonies during company numbers. The look of the concert staging was slick, with well-chosen hues of watery blue on the cast, and an attractive layout of platforms, tinsel curtain and glossy bentwood chairs on the stage. In a world steeped in mythology, we begin with the ritual to celebrate the entry to manhood of Theo, played by burgeoning leading man Gareth Keegan. Theo must choose his “Want,” which sounds like a great introduction to the first big “I wish” song, “I Will Run.” Despite being told that his life is currently “As Good as it Gets,” our restless young hero yearns for a life beyond the shelter and tradition of the island. Keegan scores another sensational power ballad with act two’s “Are You There?,” in which the gifted singer continued to demonstrate the strength of his tenor voice and the beauty of his (selectively utilised) falsetto. The redoubtable Anne Wood was Lotti, the fiercely controlling mother to two beautiful girls, Thalia, Lucy Durack, and Chora. Emily Langridge. Having lost at love herself, Lotti tries to teach dear Thalia how to snag Theo. Wood spiced her act one work with amusingly droll delivery, before going in for the kill, literally, in act two. Langridge adorably conveyed the wide-eyed youth and innocence of Chora. Kellie Rode brought gravitas and presence to the key role of troubled newcomer Maia, whose background and significance unravel slowly throughout the story. Bert LaBonte and Melissa Langton deftly balanced the stern wisdom and loving warmth of parenthood as Aeon and Lyra, noble parents of Theo. 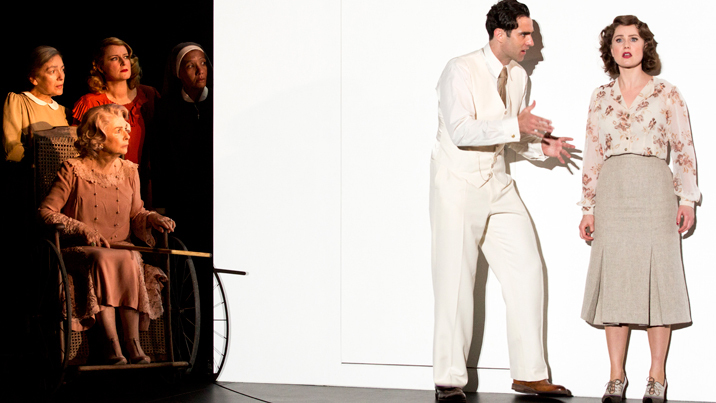 Featured ensemble and chorus roles were taken by a talented troupe with a mix of experience. 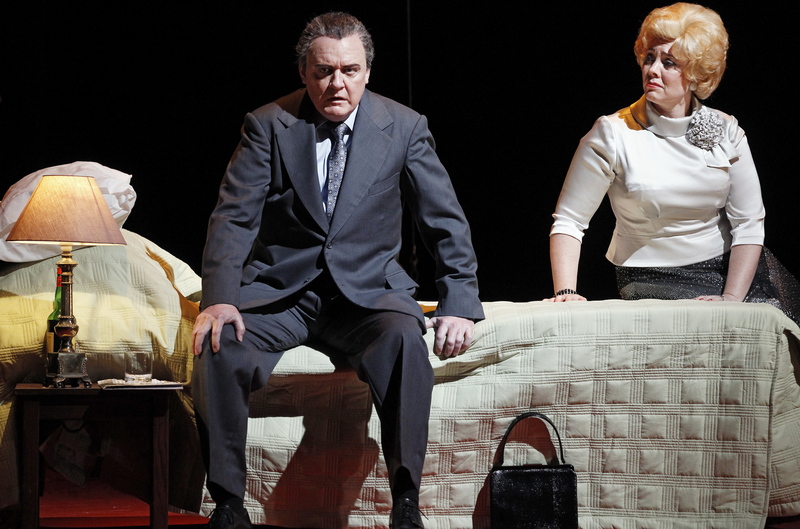 Lisa-Marie Parker’s lovely soprano was valued in the chorus numbers, offset by the powerful belt of Sophie Carter. Cameron MacDonald also served as a narrator of sorts, providing snippets of bridging information. Joel Parnis delivered sterling, reliable support, while recent graduate Ben Nicholson made an auspicious debut. Given the accessibility and wonder of the terrific music, and the dramatically engaging characters and story, it would seem that the sky is the limit for Atlantis. A fully staged production is eagerly anticipated. 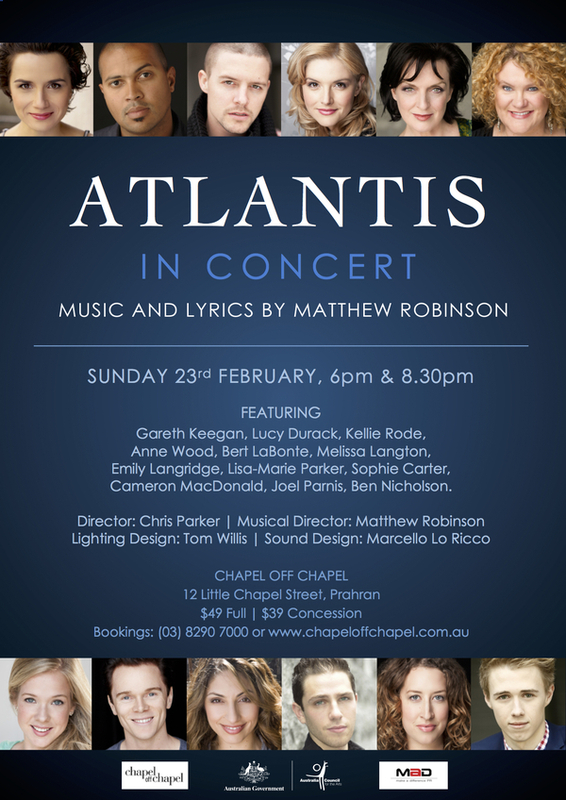 Atlantis in Concert was staged as a reading at 6pm and 8.30pm on Sunday 23 February 2014. This review published on Theatre People 24 February 2014.